Chicago’s Blooze Brothers will kick off the 14th season of Kenosha’s Peanut Butter & Jam free concert series on Thursday, July 9. 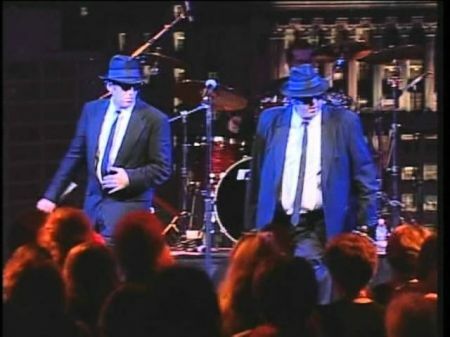 Clad in their iconic black suits, skinny ties, hats and sunglasses, Jake & Elwood and The Blooze Mobile will appear at 11:30 a.m. Then at 6:00 p.m. the brothers will put on another concert with their 11-piece show band. Now in their 25th year, the Blooze Brothers cover songs from the original Joliet Jake and Elwood Blues, as well as swing, Motown, soul, R & B, and classic rock. Elwood Blooze (a.k.a. Chuck Little) drives the Bloozemobile, books the band (avoiding Bob’s Country Bunker), and is the hardest working bandleader in the business. “Joliet” Jake Blooze (a.k.a. John Aguila) is most guilty of crimes of passion, loves fine whiskey and hard-rocking classics, and is Chuck’s ex-brother-in-law. The band rounds out with some of the best musicians in Chicago: Sheila Pepple on lead vocals, Tommy Leerschen on keyboard and vocals, Brother John Kattke on guitar and vocals, Gina Knight on drums, Jay Olazsek on bass guitar, Brian Finn on trumpet, Dave Picco on alto and baritone saxophone, Andy Blanco on tenor saxophone, and Kevin Cline on trombone. The Peanut Butter & Jam summer concert series is presented by Happenings Magazine and the City of Kenosha. Performers will appear on the Meijer stage in Kenosha’s Veterans Memorial Park, at 54th St. and 6th Ave., just north of downtown Kenosha [Google Map]. There are parking lots south of the park, and there is plenty of on-street parking in the same area. To make an adventure of it, take Metra from Chicago, then jump on the Electric Streetcar for a ride through downtown, along the lake and harbor, and exit at the McCarthy Transit Center. You’re about a block from Veterans Memorial Park. Food will be available at the PB&J Food Oasis at the park. Before and after the concert, you can take advantage of some of Kenosha’s unique nearby restaurants, like Harborside Common Grounds (5159 6th Ave.), Trolley Dogs (5501 6th Ave.), and The Coffee Pot (4914 7th Ave. – breakfast and lunch only). You can check concert schedules and updates here.